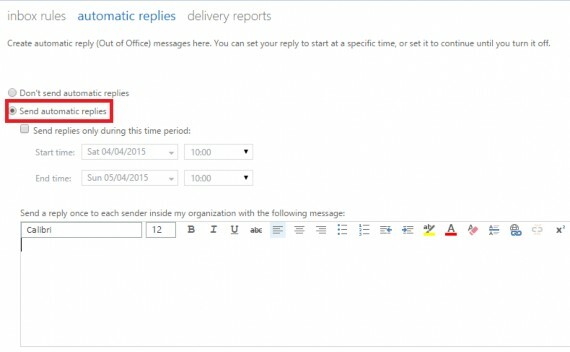 With Exchange 2013 you can set up an Out of Office message to reply automatically when you are not at work. This can only work however if you have our Autodiscover record (CNAME) in place with your domain. If you don't please consult our knowledgebase and refer to the guide: Domain Configuration and select the correct version for the exchange server you are currently on. 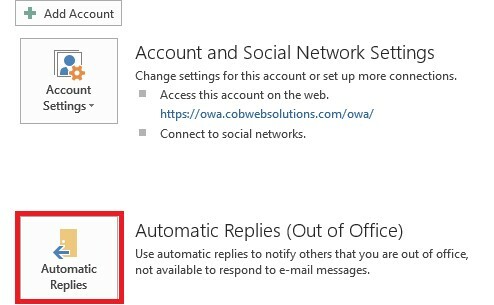 If the CNAME record is not present, please scroll down to the section below as this can still be set within the Outlook Web App. 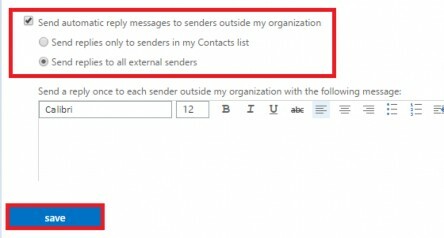 Within Outlook 2013 click onto the File at the top right. 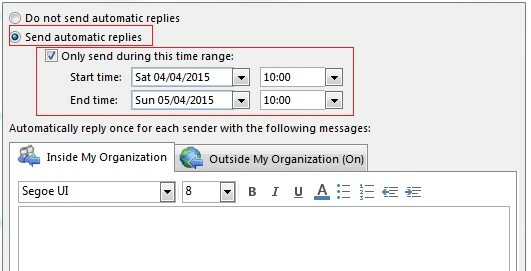 Then select Automatic Replies (Out of Office). You will then get the following pop up box. Select Send automatic replies and then choose to either set a time range when you will be out of the office, or continue to write your message. This is what will be sent to people who send you an email. This will continue until the time range is over, or when you turn off the automatic replies. If you only select Inside My Organization this will only send automatic replies to those within your company. 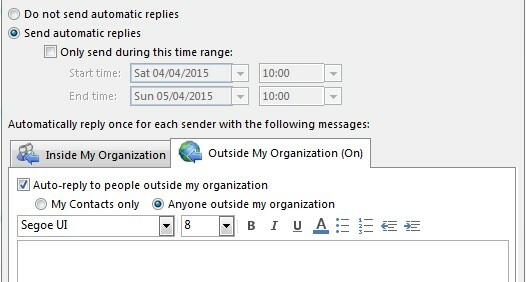 To send the automatic replies to other companies select the Outside My Organization and also set the message. Log into your Outlook Web Access (https://outlook.hs20.net), and select the cog on the right side. 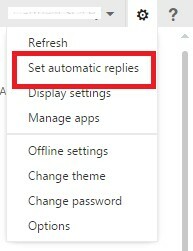 Select Set automatic replies. Click the Send automatic replies check box, then input the message you want to be sent to people who email you within your company. You can either put a time period or turn it off manually after you are back in the office. Further down you can choose to also send automatic replies to those outside your company. Select Send automatic reply messages to senders outside my organization and then choose to only send to those in your Contacts list or any external senders. Then input the message you want to be sent. You can then put a time period for the replies to be sent or manually turn it off after you are back in the office.